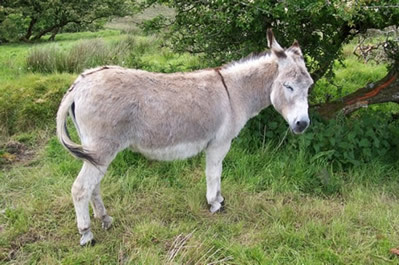 When God first started creating he made the donkey as an experiment. But He got all the proportions wrong and made a funny voice for this creature, so He kept practising until eventually He made what He considered His work of art – the human. Now, the donkey had never seen any creature walk upright on two legs before and he thought it was very funny and laughed and brayed and laughed and brayed as only a donkey can do. God was offended that the humble donkey didn’t like His creation so he told the donkey that to put him in his place he would, from then on, have to work as a beast of burden for this human and do his bidding always. 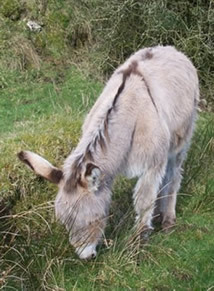 The donkey was extremely sad to be treated in this way when he had meant no harm but suffered his fate for hundreds of years without complaint, even though he was often beaten and starved and very badly treated by this so-called ‘superior’ being. He learned to be afraid of humans and to hate them. Then one night he felt pity for a desperately tired woman who was crossing the desert with her husband, vainly trying to reach shelter before she gave birth to her child. The donkey offered his help and carried the woman to Nazareth where shortly afterwards the baby Jesus was born. The donkey called in all the other animals to create heat and keep the shelter warm for the baby until the sun came up again the next day. The little donkey liked this baby and followed Him around all through his childhood and later on in his life, never missing an opportunity to serve Him as He seemed to be a special kind of person, very kind and gentle and He never beat the donkey. Then came that fateful time when the other people turned on Jesus and made him wear a crown of thorns so his skin was bleeding and sore, and to carry a great wooden cross far too heavy for his small frame. "Let me wear the crown of thorns for you", begged the donkey, "for I have thick fur around my head so the thorns will not scratch so deeply, and besides I am used to being beaten and hurt. I will not feel it. ""Thank you’"said Jesus, "but it is bidden that I wear the crown of thorns for I am King of the Jews. But I will remember your kindness." "Then let me carry that heavy cross for you", begged the donkey, "for it is too much for you and I am used to being overloaded and whipped when I cannot carry the burden that is put upon me. For love of you, let me carry it!" Jesus stopped, and searched the little donkey’s face and saw in his eyes nothing but true unconditional love and compassion, and he was saddened for mankind. "Thank you dear donkey," He said, "but I do not have to explain to you as I would to others that everyone has his own cross to bear, and now this is mine and I must carry it to help mankind to understand himself. He will not know what he has done until it is too late. Only you, in your humility, can see that what you do to others you do to yourself and to God. God will remember your pure heart and reward you in time." And so Jesus died on the cross and went to heaven where first of all he went to God, His father, and told Him of the love and tenderness shown to Him by the humble donkey when all the rest of God’s creatures laughed and enjoyed His suffering. "Then I shall reward the donkey", said God, and he called up the chief of all donkeys and said to him: "You have shown great kindness in the generous hearts of your species despite the abysmal treatment you have all suffered at the hand of my ‘superior’ creation, Man, so now I will reward you thus." “You will keep your oversized ears as your trademark but they will serve you well to hear sounds from all sides and from such great distances that others will marvel at your ability. You will still keep your loud and harsh voice but instead of people laughing at you, you will now use it to laugh at them, to laugh at the world, because you may know that whatever befalls you and your species you are blessed by God and will take your place beside Him in heaven. And instead of wearing the crown of thorns, as you were willing to do for Jesus, you will be able to eat and survive on all the thorny, prickly, dry fodder that no other animal can eat so that even in places of great hardship you will still find nourishment. And as a special mark of respect I place my cross upon your back so the world may know you have been touched by the Hand of God and are wholly (holy) in His presence." And so it is to this day that the donkey wears the cross on his back, shakes his long ears and brays to the world. And if ever you are tempted to laugh at the donkeys, just remember . . . . . they are God’s special creatures.